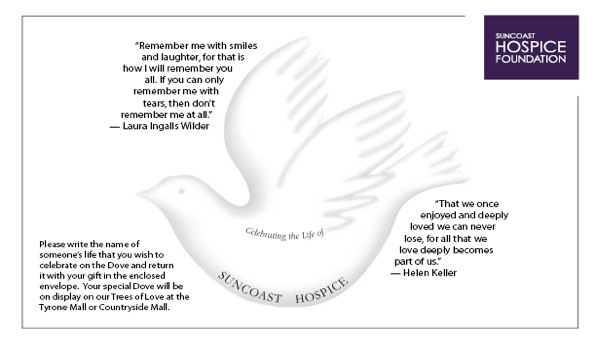 Suncoast Hospice (Clearwater, FL) is one of the largest hospices in America, and as a nonprofit organization, is wholly committed to serving those living with chronic and terminal illnesses, nearing the end of life, or experiencing grief. Their goal is to help each person in the community maintain the best quality of life and live each day with meaning and purpose. To help provide those services, it’s necessary for Suncoast Hospice to maintain a constant stream of donations from the community through its annual fund. Over the past several years, those donations became stagnant or were decreasing year over year through typical direct mail campaigns. Suncoast Hospice needed to jump start its current donor base and develop a strategy to help reactivate lapsed donors and acquire new ones. Our first step was to better understand the current donor base and their reaction to past campaigns by applying the D4i Consultative Methodology. This was done through a thorough review of existing annual fund materials and conducting extensive research of the donor database. After conducting this review, it was determined that to increase donors and donation amounts, a more personalized and interactive strategy should be implemented for the end-of-year direct mail campaign. Using past gift history, a variable ask matrix was created to increase individual donation amounts. This was determined using a combination of last gift amount, recency of last gift, and cumulative giving year over year. To reactivate lapsed donors, their last gift would be recognized on the response form as well. The theory would be that reminding them of past affiliation would increase the likelihood of reactivating as a current donor. To create interaction with the current or potential donors and the direct mail piece, we developed the “Remembrance Dove” campaign. The direct mail package was designed to include a large dove that donors could use to honor or remember someone close to them by writing his or her name on the dove. 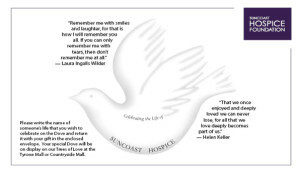 The donor would then send that dove along with a gift in a provided return envelope to Suncoast Hospice. Once received, the dove would be displayed on a tree at one of their facilities. The campaign resulted in the highest response rate of any end-of-year campaign since 2004 and generated the second highest net revenue since 2003, bringing in over $90,000. It also reactivated the most lapsed donors and brought in the most new donors for a direct mail campaign since 2002. Moreover, the campaign was so successful that in order to give those who did not respond to the original campaign another chance to donate, a follow-up appeal was developed and sent out six weeks after the initial campaign was completed, based on our recommendation. The follow-up campaign netted an additional $15,000 in revenue. Both mailings combined resulted in one of the most successful and profitable fundraising campaigns at Suncoast Hospice. We continue to refine strategy for the hospice by balancing growth and retention within its donor database along with acquisition of new donors into the pipeline.